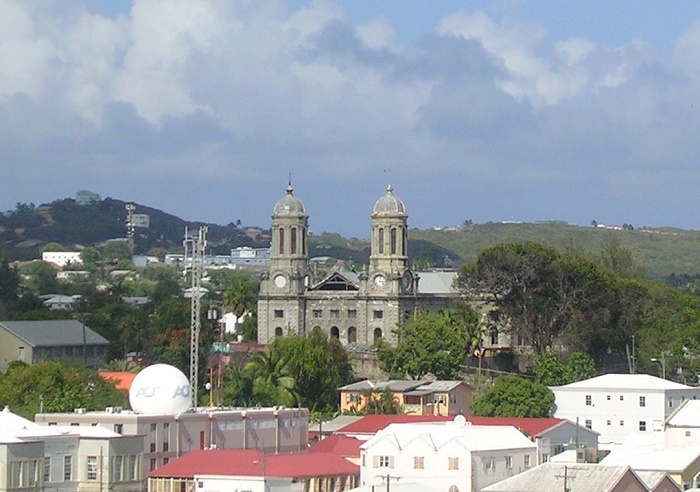 St. John’s Cathedral also known as the St. John the Divine, the Cathedral Church of the Diocese of North Eastern Caribbean and Aruba, is an Anglican church perched on a hilltop in St. John’s, Antigua and Barbuda. 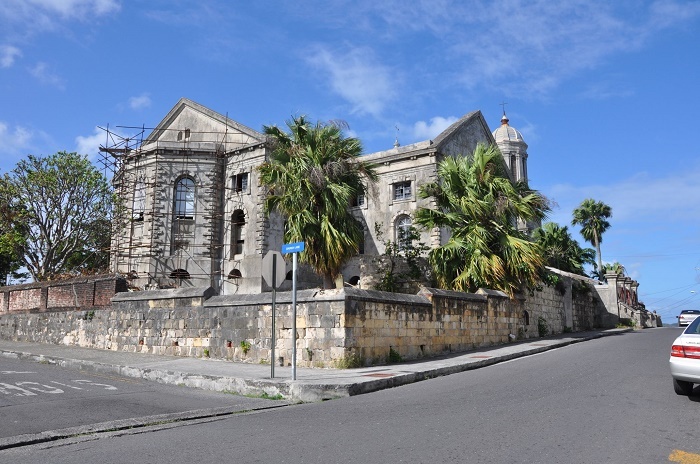 Two St. John’s Anglican Churches have already stood on the site of the present cathedral. 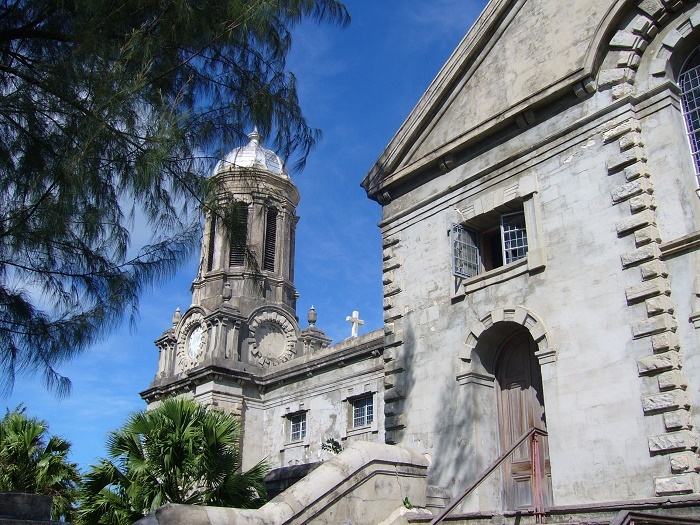 The Cathedral is represented as a city landmark, which is topped by Baroque-style towers, and has experienced many reincarnations. 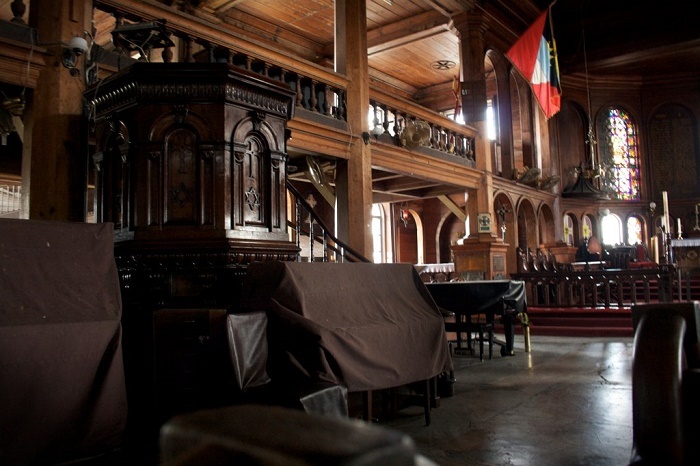 The first church originally was consecrated as a wooden structure, built as early as 1681 and was said to be “totally destitute of beauty or comfort”. The second was constructed with English brick about 1720 when the first fell in disrepair and became too small. 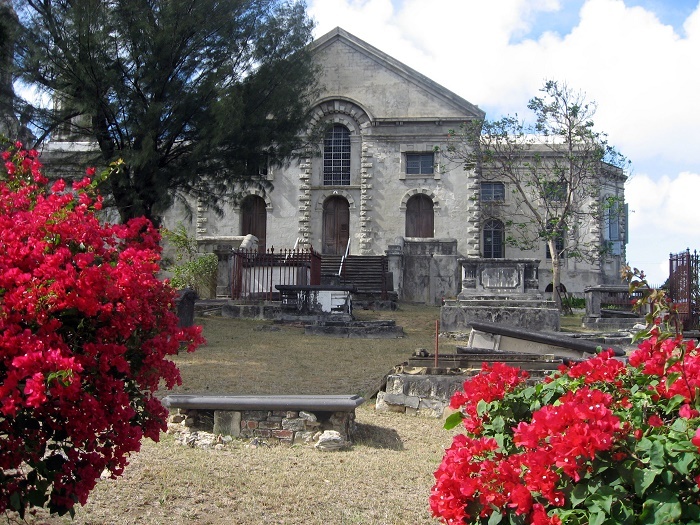 The church was designed by Mr. Robert Cullen and had a short steeple at its western end. 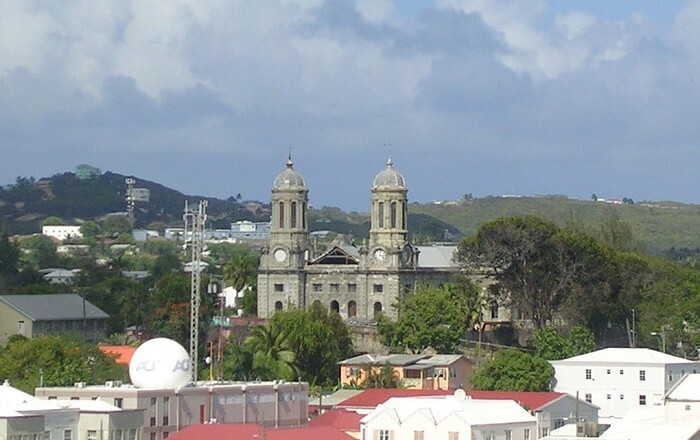 After over a century, the church was elevated to the status of a cathedral when the Diocese of Antigua was created in August 1842. 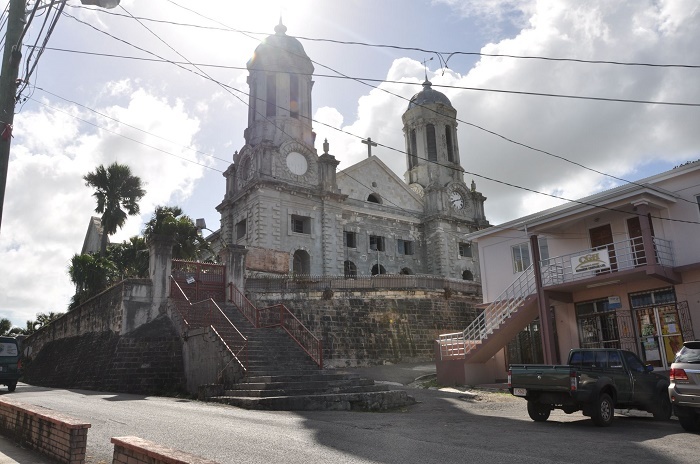 Local lore states the carved figures of St. John the Baptist and St. John the Evangelist at the iron entrance gate originally adorned the masts of one of Napoleon’s ships. 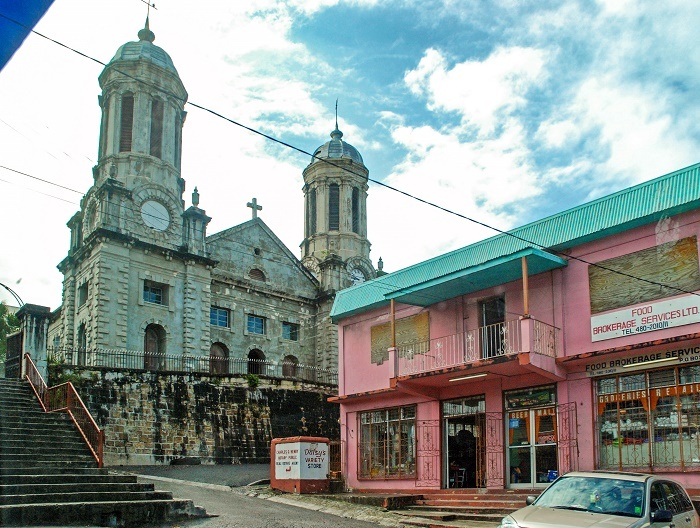 The Cathedral is at the highest point of Saint John’s town. 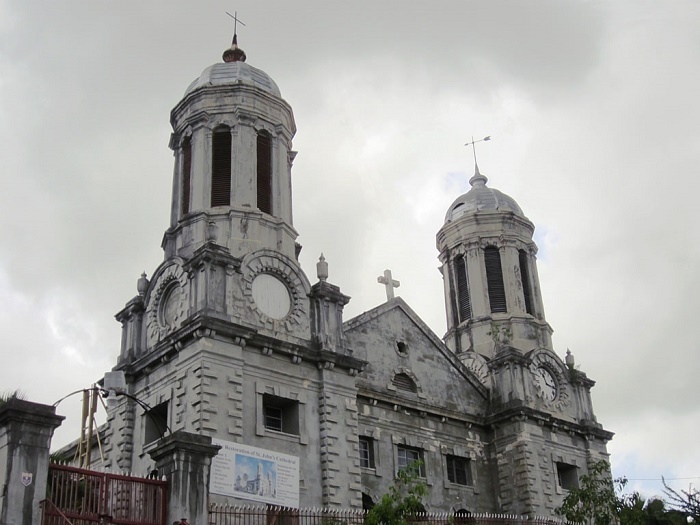 The Cathedral is dominated by twin towers at the west end and provides a distinct baroque flavor. They are 70 ft high and the cupolas that crown the towers are aluminum in color. 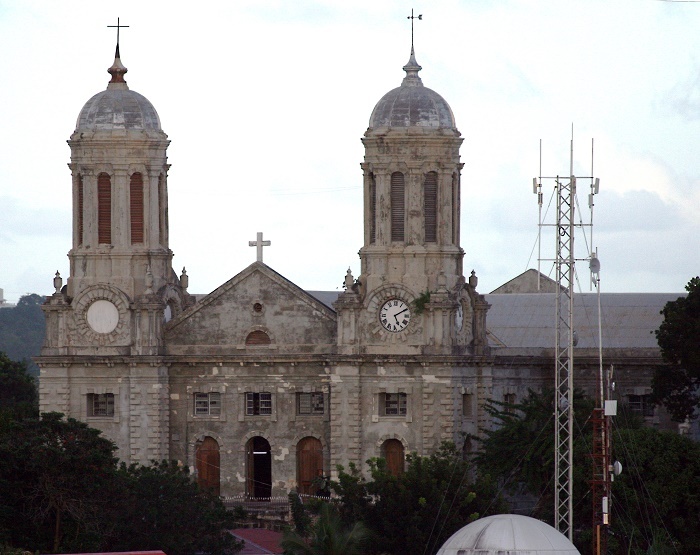 At the time of erection, the edifice was criticized by ecclesiastical architects as being like “a pagan temple with two dumpy pepper pot towers”, however in modern times the edifice has been cited as “the most imposing of all the Cathedrals of the West Indian Province”. Originally the south gate was the main entrance to the Cathedral. On top of its pillars are the bronze figures of St. John the Divine and St. John the Baptist. H.M.S. Temple is said to have taken these figures from a French ship destined for Martinique in 1756 during the Seven Years War. The iron gates themselves date from 1789. There is a restoration project going on, and due to the lack of financial means, it goes really slowly. However, if you are able to go inside as the workers are working on the restoration, you will see that this is a masterpiece. The new wood work is amazing to see as is the work that has been done.